Cytochromes P450 (P450s) are down-regulated in hepatocytes in response to inflammation and infection. This effect has been extensively studied in animal models, but significantly less is known about responses in humans and even less about responses in the absence of inducing agents. This article focuses on the effects of bacterial lipopolysaccaride (LPS), interleukin-6 (IL-6), tumor necrosis factor-α (TNF), interferon γ (IFN), transforming growth factor-β (TGF) and interleukin-1β (IL-1) on expression of CYP2B6 and the CYP2C mRNAs in human hepatocytes. These effects were compared with responses of the better studied and more abundant CYP3A4. CYP3A4 and CYP2C8 were down-regulated by all cytokine treatments. CYP2C18, which is expressed at very low levels in liver, was unaffected by cytokine treatments. The other CYP2Cs and CYP2B6 showed cytokine-specific effects. CYP2C9 and CYP2C19 showed almost identical response patterns, being down-regulated by IL-6 and TGF but not significantly affected by LPS, TNF, IFN, or IL-1. CYP2B6 mRNA responded only to IL-6 and IFN. IL-6 down-regulated the mRNAs of all P450s studied. Western blot analysis of P450 protein expression supported the mRNA data to a large extent, although some inconsistencies were observed. Our results show that human CYP2C8, 2C9, 2C18, 2C19, 2B6, and 3A4 responses to inflammation are independently regulated and indicate that this fine control may have a critical effect on human drug responses in disease states. The liver responds to inflammation and infection by increasing levels of acute-phase proteins and concurrently down-regulates liver-specific proteins involved in drug metabolism (Morgan, 1997; Renton, 2004; Aitken et al., 2006). Cytochromes P450 (P450s) are the major drug-metabolizing enzymes in the liver and are significantly down-regulated by infection and inflammatory stimuli (Morgan, 1997; Aitken et al., 2006). The rapid down-regulation of P450 mRNAs (Morgan, 1997) has led to a focus on transcription as the primary mechanism of these effects, and this view is supported by the size and speed of transcriptional down-regulation as demonstrated in rats in vivo (Cheng et al., 2003). In humans, this down-regulation is associated with decreased drug clearance (Kraemer et al., 1982; Rivory et al., 2002; Carcillo et al., 2003; Renton, 2004) and can result in increased incidence of drug toxicity (Kraemer et al., 1982). Three lines of evidence support a major role of inflammatory cytokines as the mediators of P450 regulation in the liver during inflammation. First, cytokines can down-regulate P450 expression in cultures of rodent and human hepatocytes (Abdel-Razzak et al., 1993; Morgan, 1997; Sunman et al., 2004; Aitken et al., 2006). Second, mice with null mutations in cytokine or cytokine receptor genes display diminished P450 down-regulation in response to some inflammatory stimuli (Siewert et al., 2000; Ashino et al., 2004). Third, P450-dependent drug clearance has been correlated inversely with plasma interleukin-6 (IL-6) in patients with tumors (Rivory et al., 2002) or congestive heart failure (Frye et al., 2002). Studies of P450 regulation in human hepatocytes have confirmed that inflammatory cytokines regulate human P450 gene expression and that the effects of individual cytokines can be P450 gene-specific (Abdel-Razzak et al., 1993, 1994, 1995; Muntane-Relat et al., 1995; Donato et al., 1997, 1998; Morgan, 1997; Guillén et al., 1998; Sunman et al., 2004; Aitken et al., 2006). Many of these studies have focused on cytokine regulation of drug-induced P450 expression (Abdel-Razzak et al., 1994, 1995; Muntane-Relat et al., 1995; Guillén et al., 1998; Sunman et al., 2004). However, as discussed in a recent review (Aitken et al., 2006), regulation of constitutive P450 expression by cytokines is likely to be independent of nuclear receptors such as constitutive androstane receptor (CAR) and pregnane X receptor (PXR), which play such a critical role in inflammatory down-regulation of inducible P450 expression. There is very little information about the regulation of the constitutive expression by cytokines of human hepatic P450s in general and of CYP2B6 and the CYP2C subfamily in particular. Only one study focused on human CYP2C responses to inflammation in the absence of chemical inducers. However, the CYP2C subfamily members were not distinguished, and the effect was only seen after a 72-h incubation. (Abdel-Razzak et al., 1993). Two studies reported that CYP2B6-dependent catalytic activity was decreased after incubation of hepatocytes with interferon-γ (IFN) or hepatocyte growth factor, but RNA or protein expression was not studied (Donato et al., 1997, 1998). The CYP2Cs and CYP2B6 each have significant roles in drug metabolism (Goldstein and de Morais, 1994; Shimada et al., 1994; Totah and Rettie, 2005). Therefore, to recognize and predict the effects of different diseases, with different cytokine profiles and time courses, on drug clearance, there is a need to understand how they are regulated by inflammatory cytokines. We hypothesized that constitutive expression of human CYP2C subfamily members and CYP2B6 would be differentially regulated by cytokines in primary human hepatocyte cultures and that this regulation would be different from that of the well studied CYP3A4, which is responsible for the metabolism of more than 50% of currently available drugs (Schuetz, 2004). In this study, we characterized the regulation of CYP2B6, 2C8, 2C9, 2C18, 2C19, and 3A4 by agents associated with inflammatory responses that were previously shown to regulate P450s in primary rodent hepatocytes: interleukin-1β (IL-1), IL-6, tumor necrosis factor-α (TNF), IFN, transforming growth factor-β (TGF), and bacterial lipopolysaccharide (LPS). As discussed above, both rodent and human studies to date indicate that pretranslational mechanisms are the primary cause of decreased P450 enzyme expression and activity. For this reason and because of the limited availability of human hepatocytes, we focused on the regulation of P450 mRNAs. Our results support our hypothesis that these important drug-metabolizing enzymes show differential responses to cytokines, indicating that the influence of inflammation on human drug metabolism is likely to be disease- and drug-specific. Reagents. All reagents were purchased from Sigma-Aldrich (St. Louis, MO) unless otherwise stated. IL-6 was from Calbiochem (San Diego, CA), TNF and TGF were from Invitrogen (Carlsbad, CA), and IFN was from BD PharMingen (San Diego, CA). All cytokines were reconstituted and stored according to manufacturer specifications as high concentration stocks. Antibodies were purchased to CYP3A4, CYP2C9 (Xenotech, Lenexa, KA), CYP2B6 (BD Biosciences Discovery Labwear, Bedford, MA), and glyceraldehyde 3-phosphate dehydrogenase (GAPDH) (EnCor Biotech, Alachua, FL). Supersomes (microsomes of insect cells expressing P450 enzymes) were from BD Gentest (Woburn, MA). Human Hepatocyte Cultures. These studies were carried out in accordance with the Declaration of Helsinki and were designated exempt from review by the Emory University Institutional Review Board. Human hepatocytes were received from Dr, Steven Strom at the University of Pittsburgh via the National Institutes of Health-sponsored Liver Tissue Procurement and Distribution System program. They were prepared within 24 h of procurement from livers not suitable for transplantation. Details on liver donors are provided in Table 1. Hepatocytes were isolated as described in Strom et al. (1996) by a three-step collagenase perfusion technique and plated on collagen-coated 12-well plates (10 × 106 cells/plate) or T25 flasks (3 × 106 cells/flask). Cells were cultured for 48 h before delivery in hepatocyte maintenance media (Cambrex Bioscience Walkersville, Walkersville, MD). Upon receipt, media were changed to Williams E cell culture media supplemented with 150 nM insulin, 3 nM dexamethasone, and 100 units/ml penicillin-streptomycin. Cells were incubated for a further 24 to 48 h. Cells were maintained at 37°C in 5% CO2 throughout the experiment with the exception of the shipping period. All cells were cultured for a minimum of 72 h between isolation and treatment. Media were changed every 24 h.
Treatments. Cytokines were diluted from stock solutions into media just before treatment. Final concentrations of IL-6, TNF, IFN, and TGF were 10 ng/ml and of IL-1 was 5 ng/ml. A stock solution of 1 mg/ml LPS was prepared in phosphate-buffered saline (PBS) and diluted to a final concentration of 10 μg/ml. PBS was added to equalize the final volume of diluent in all cultures. Control cells were treated with media plus an appropriate volume of PBS. Hepatocytes were harvested 24 h after initiation of treatment, unless otherwise indicated. The cytokine concentrations used were based on maximal effects measured in our laboratory for CYP2C11 in rat hepatocytes. Preparation of Cell Lysates and RNA. Media were removed from T25 flasks or 12 well plates and cells were washed twice in ice-cold PBS. For preparation of cell lysates, flasks were scraped to release cells into phosphate-buffered saline, and the cells were pelleted, resuspended in 200 μl of cell lysis buffer (50 mM Tris, pH 7.4, 0.1% SDS, 0.5% Nonidet P40, and 1% EDTA), and sonicated for 10 to 12 s with a Microson ultrasonic cell disruptor on power setting 15. A protease inhibitor cocktail containing 4-(2-aminoethyl)benzene-sulfonyl fluoride, pepstatin A, E-64, bestatin, leupeptin, and aprotinin was added, and lysates were stored at -80°C. Protein levels were measured using the BSA assay from Pierce Biotechnology (Rockford, IL). Total RNA was prepared from 12-well plates using TRIzol (Invitrogen) according to the manufacturer's directions. RNA concentrations and quality were determined spectrophotometrically by measuring absorbance at 260 nm and by the 260/280 nm ratio. Real-Time RT-PCR. Purified total RNA was reverse transcribed using the Superscript first-strand synthesis system for RT-PCR kit (Invitrogen) according to the manufacturer's instructions. Primers for the human P450s studied are listed in Table 2. When possible, published primer pairs were used, including those for CYP2B6, CYP3A4, and CYP2C19 (Rodríguez-Antona et al., 2000) and for CYP2C18 (Nishimura et al., 2002). Primers for GAPDH, CYP2C8, and CYP2C9 were designed using the Primer Select software program (DNAS-TAR, Inc., Madison, WI). All primers were subjected to Blastn analysis to exclude any oligonucleotides with high similarity to other human P450 mRNA transcripts. Real-time RT-PCR analysis was performed on an ABI 7300 sequence detection system (Applied Biosystems, Foster City, CA) to quantify relative P450 mRNA expression in human hepatocytes. Reactions were performed in a total volume of 25 μl using SYBR Green Master Mix reagent (Applied Biosystems), 2 μl of template cDNA, and 10 μM forward and reverse primers. All reactions were performed in duplicate. Assay plates were incubated at 50°C for 2 min and then at 95°C for 10 min followed by 40 cycles of 95°C for 15 s plus 1 min at the relevant annealing temperature (see Table 2 for details). Levels of the mRNA for the housekeeping gene GAPDH were monitored in parallel to normalize the total amount of cDNA in each sample. Results are expressed as relative levels of P450 mRNA and were normalized to control samples fixed at an arbitrary value of 1. Livak and Schmittgen (2001) described the Ct method, which was used to calculate the amount of target P450 in a treated sample normalized to GAPDH and relative to the control P450 samples. A single PCR product of expected size was confirmed by agarose gel electrophoresis for each primer set, and the specificities of the CYP2C8, 2C9, and 2C19 primers were verified by sequencing the products. Specificity was also confirmed on a routine basis by checking product dissociation curves in each reaction well. Western Blotting. SDS-polyacrylamide gel electrophoresis and Western blotting were used to measure P450 protein levels. Equal amounts of cell lysate (10-25 μg) were loaded into each lane of a 5 to 15% gradient polyacrylamide gel (Criterion Tris-HCl gel; Bio-Rad, Hercules, CA) for analysis and transferred onto a nitrocellulose membrane. Blots were probed with antibodies to CYP3A4, CYP2C9, and CYP2B6. The CYP2C9 antibodies cross-reacted to a limited extent with CYP2C19; however, CYP2C9 and CYP2C19 could be distinguished by their different mobilities on the gels, and the antibody detected only CYP2C9 in cell lysates under the conditions used (see Fig. 2A). Blots were blocked according to the antibody manufacturer's directions and incubated overnight at 4°C with the respective primary antibodies diluted according to the manufacturer's specifications in PBS containing 0.05% Tween 20 (PBS-Tween). Nitrocellulose filters were then washed three times for 10 min in PBS-Tween at room temperature before the application of horseradish peroxidase-coupled secondary antibody (Pierce Biotechnology) for 1 h at room temperature. The membranes were washed again three times for 10 min in PBS-Tween before visualization using an enhanced chemiluminescence detection system (Supersignal West Pico; Pierce Biotechnology). The intensities of stained bands were measured by densitometry using Kodak Imaging Software 4.0.1 (Eastman Kodak, New Haven, CT). Statistical Analysis. Control and treatment groups were compared by one-way analysis of variance and a Dunnett's test using SPSS (SPSS Inc., Chicago, IL). 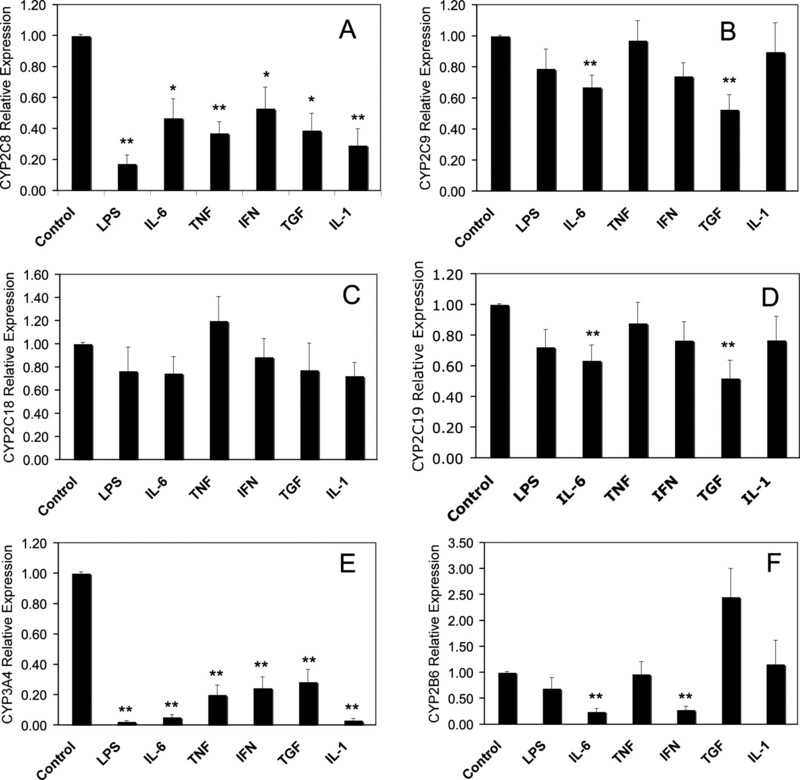 Effects of Cytokine Treatments on CYP2C mRNAs in Human Hepatocytes. Results are presented as the average of nine human hepatocyte preparations (Table 1) from individuals ranging from 15 months to 84 years of age. CYP2C8 was significantly down-regulated by all treatments tested (Fig. 1A). LPS caused the greatest effect, resulting in a decrease in mRNA by approximately 80% compared with control. All of the individual cytokines decreased CYP2C8 to between 40 and 60% of control. The LPS effect was approximately twice the decrease seen with individual cytokines, suggesting that at least two pathways of down-regulation exist for LPS. In contrast, CYP2C9 mRNA was significantly affected by only IL-6 and TGF (Fig. 1B). These cytokines decreased mRNA levels by 30 to 50%. CYP2C19 (Fig. 1D) was also down-regulated in a pattern similar to that of CYP2C9, with IL-6 and TGF displaying significant effects, whereas IL-1 and TNF clearly had no effect. CYP2C18 mRNA was also examined, although current data suggest that the protein is not expressed in the human liver. Unlike the other CYP2Cs, none of the inflammatory cytokines showed any significant effects on the very low constitutive levels of CYP2C18 mRNA (Fig. 1C). Effects of Cytokine Treatments on CYP3A4 and CYP2B6 mRNAs. As with the CYP2C mRNA, all data were averaged from the same nine individuals shown in Table 1. CYP3A4 was significantly down-regulated to 20% or less of control in response to LPS and all of the cytokines tested, with LPS, IL-6, and IL-1 resulting in levels below 5% of control (Fig. 1E). These responses are qualitatively similar to those of CYP2C8, although generally larger in magnitude. CYP2B6 exhibited a very different cytokine response pattern with only IL-6 and IFN significantly decreasing mRNA levels by 80% (Fig. 1F). TGF-treated cells showed a trend toward a 2.5-fold induction of CYP2B6 mRNA levels, which just failed to reach statistical significance. Data for CYP3A7 were also collected from the two infant samples used in this study. In the samples tested, the CYP3A7 down-regulation pattern was similar to that of CYP3A4 (data not shown). IL-6 was the only cytokine that showed any noticeable difference: CYP3A7 mRNA decreased to 25% of control with IL-6 treatment, whereas the decline in CYP3A4 mRNA was to approximately 10% of control. Regulation of CYP Protein Expression by Cytokines. To determine whether regulation of human CYP mRNAs is reflected in corresponding changes in protein expression, we analyzed protein expression of CYP2C9, CYP3A4, and CYP2B6 in hepatocytes from two individuals designated as 1315 and 1294. Protein samples were collected after treatment for 40 and 24 h, respectively. Western blotting results are shown in Fig. 2. Note that mRNA levels were measured after 24 h of treatment in these samples, and the results for these two preparations were representative of the compiled results shown in Fig. 1. CYP2C9 protein was down-regulated by all agents tested after 24 h of treatment in HH1294 (Fig. 2). After 40 h of treatment, protein levels of CYP2C9 were still profoundly suppressed in LPS-, IL-6-, and TNF-treated HH1315 hepatocytes but were not significantly different from control in cells treated with IFN, TGF, or IL-1 (Fig. 2). CYP3A4 protein levels at 24 and 40 h of treatment in the two preparations were very similar with each treatment, and significant effects of each cytokine, except TNF, were observed at one of the two time points (Fig. 2). Cells treated with TNF trended toward the same effects as most of the other treatments but missed statistical significance. The protein levels of TNF-, IFN-, TGF-, and IL-1-treated hepatocytes showed good agreement with mRNA levels. However, LPS and IL-6 down-regulated mRNA levels by 90% at 24 h, whereas protein levels were only reduced to approximately 25 to 50% of control 24 or 40 h post-treatment. Effects of cytokines on P450 mRNA expression in human hepatocytes. Cells were treated with phosphate-buffered saline (1 μl/ml, Control), LPS (10 μg/ml), IL-6 (10 ng/ml)), TNF (10 ng/ml), IFN (10 ng/ml), TGF (10 ng/ml), or IL-1 (5 ng/ml) for 24 h and mRNA levels of CYP2C8 (A), CYP2C9 (B), CYP2C18 (C), CYP2C19 (D), CYP3A4 (E), and CYP2B6 (F) were determined as described under Materials and Methods. All treatments were carried out in triplicate for each individual, and the results are the means ± S.E.M. of nine subjects in each group. Significant differences compared with control: *, p < 0.05; **, p < 0.005. The effects of cytokines on CYP2B6 protein expression are shown in Fig. 3. Consistent with the mRNA results, IL-6 at 24 h and IFN at 40 h both down-regulated CYP2B6 protein, whereas LPS had no effect. 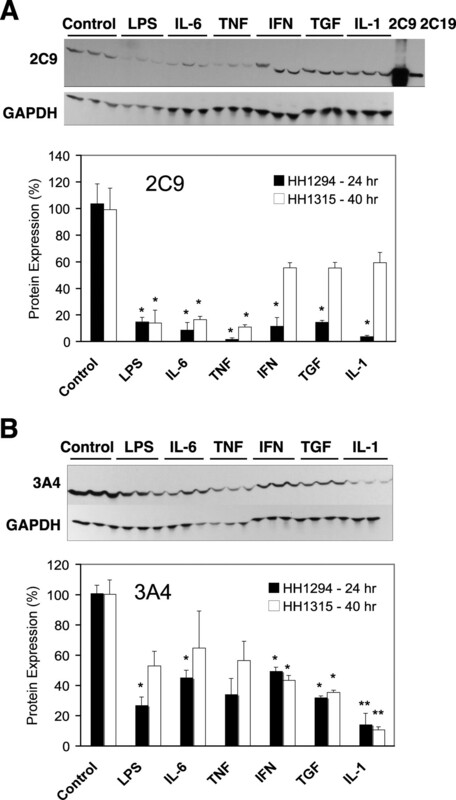 However, TNF, TGF, and IL-1 at 24 h each caused down-regulation of CYP2B6 protein to 13, 54, and 42% of control, respectively (Fig. 3), whereas no effect on CYP2B6 mRNA was observed. In this article, we present for the first time a detailed characterization of the effects of agents involved in the inflammatory response on the constitutive (inducer-free) expression of CYP2B6 and individual members of the CYP2C subfamily. The results confirm our hypothesis that some of these important drug-metabolizing P450s show differential responses to cytokines, in contrast to others, which seem to be nonspecifically down-regulated by all stimuli tested. Much of the down-regulation of drug-inducible CYP expression by cytokines can be ascribed to effects on the nuclear receptors that mediate drug induction. The effects of IL-1 on human P450 expression induced by drugs that act via the CAR have been shown to involve the down-regulation of CAR expression (Assenat et al., 2004). On the other hand, cytokines can down-regulate PXR- or aryl hydrocarbon receptor-induced P450 expression via receptor down-regulation (Beigneux et al., 2002) and/or inhibition of receptor function (Tian et al., 1999; Zhou et al., 2006), but down-regulation of constitutive P450 expression does not require PXR (Richardson and Morgan, 2005). Therefore, results from studies on drug-induced expression cannot be extrapolated to constitutive expression. Indeed, the constitutive expression of CYP3A4 is down-regulated by oncostatin M (Guillén et al., 1998), a member of the IL-6 family, IL-1 and IL-6 (Sunman et al., 2004), IFN (Donato et al., 1997), and hepatocyte growth factor (Donato et al., 1998). The effect of IL-6 appears to be partially mediated by the induction of a truncated form of CCAAT enhancer binding protein β, lacking a transactivation domain, that antagonizes the positive regulation by other CCAAT enhancer binding protein isoforms and hepatic nuclear factor-3γ (Jover et al., 2002; Rodríguez-Antona et al., 2003; Martinez-Jiménez et al., 2005). An inspection of the consolidated mRNA data identifies four distinct patterns of transcriptional response among the P450s studied, and these are summarized in Table 3. In group 1, CYP2C8 and CYP3A4 were down-regulated by all of the agents tested. Therefore, we predict that most infections or diseases associated with inflammation will down-regulate these P450s. Whereas CYP3A4 is responsible for the metabolism of many drugs (Schuetz, 2004), CYP2C8 catalyzes retinol and retinoic acid oxidation (Totah and Rettie, 2005). In group 2, CYP2C9 and CYP2C19 were down-regulated by IL-6 and TGF only. In group 3, CYP2B6 was sensitive to LPS, IL-6, and IFN only. Therefore, we predict that regulation of group 2 and 3 P450s may depend on the exact nature of the infection or inflammatory stimulus. The CYP2Cs constitute 10 to 20% of the total P450 content in the human liver, with CYP2C9 and CYP2C19 being the most abundant (Shimada et al., 1994). CYP2C9 and CYP2C19 metabolize many commonly used drugs, including antibacterial, anticoagulant, antidiabetic, and nonsteroidal anti-inflammatory agents (Goldstein and de Morais, 1994; Totah and Rettie, 2005). CYP2B6 is responsible for only 3 to 5% of hepatic P450 but is involved in the metabolism of approximately 25% of all drugs (Gervot et al., 1999; Lang et al., 2001). However, interindividual variation in CYP2B6 levels is extensive and its overall low expression makes this P450 difficult to study. In group 4, the very low expression of CYP2C18 was unaffected by any treatment. The significance of CYP2C18 in drug metabolism is unclear, because although the mRNA is expressed in liver, CYP2C18 protein has not been detected (Läpple et al., 2003). Regulation of human CYP2C and CYP3A protein expression by cytokines. Cells from patient HH1294 or HH1315 were cultured in T25 flasks, and treated with phosphate-buffered saline (1 μl/ml, Control), LPS (10 μg/ml), IL-6 (10 ng/ml), TNF (10 ng/ml), IFN (10 ng/ml), TGF (10 ng/ml), or IL-1 (5 ng/ml) for 24 or 40 h, respectively. Cell lysates were prepared, and Western blot assays for CYP2C9 (A) and CYP3A4 (B) were performed as described under Materials and Methods. Lanes marked 2C9 and 2C19 were loaded with 1 μg of insect cell microsomes (Supersomes) expressing the respective P450s. Tops, Western blots of HH1315 (40 h of treatment) probed for CYP2C9 or CYP3A4. Blots reprobed with antibody to GAPDH are displayed under the respective P450 blots. Bottoms, relative levels of P450 proteins were quantified, normalized to GAPDH to account for any loading or transfer discrepancies, and plotted as a percentage of the control group mean. Data represent the means ± S.E.M. of three independent samples for each group. Significant differences compared with control: *, p < 0.05; **, p < 0.005. Regulation of human CYP2B6 protein expression by cytokines. Cells from patient HH1294 or HH1315 were cultured in T25 flasks and treated with phosphate-buffered saline (1 μl/ml, Control), LPS (10 μg/ml), IL-6 (10 ng/ml), TNF (10 ng/ml), IFN (10 ng/ml), TGF (10 ng/ml), or IL-1 (5 ng/ml) for 24 or 40 h, respectively. Cell lysates were prepared and Western blot assays for CYP2B6 were performed as described under Materials and Methods. Top, Western blots of HH1315 (40 h of treatment) probed for CYP2B6. Blots reprobed with antibody to GAPDH are displayed under the P450 blots. Bottom, relative levels of CYP2B6 proteins were quantified, normalized to GAPDH to account for any loading or transfer discrepancies and plotted as a percentage of the control group mean. Data represent the means ± S.E.M. of three independent samples for each group. Significant differences compared with control: *, p < 0.05. Notably, despite these differential patterns of regulation, all of the P450s studied except CYP2C18 were down-regulated by IL-6, albeit to differing extents. This finding, combined with the previously mentioned correlations of IL-6 plasma levels with P450-dependent drug clearance and the attenuation of P450 down-regulation by some inflammatory stimuli in IL-6-null mice, is consistent with a prominent physiological role of this cytokine in P450 regulation. Obviously, it is possible that the regulation of P450 expression by cytokines will have different time- and concentration-dependencies that may affect the accuracy of the above predictions. Because of the limited availability of material, we were compelled to use concentrations and times that have been proven to be optimal in rat hepatocytes. The relatively rapid down-regulation of P450 mRNAs we observed can be contrasted with a previous report that IL-1, IL-6, and TNF treatments resulted in 50% suppression of CYP2C and CYP3A mRNAs but only after 72 h of treatment (Abdel-Razzak et al., 1993). However, these results were inconsistent across cultures. We were able to study the human CYP2Cs individually along with CYP3A4 and CYP2B6 in a larger number of human samples and obtain a detailed profile of human P450 response to a wider range of cytokines. We saw no effect of IL-1 on CYP2C9, 18, or 19 with only CYP2C8 mRNA showing much response after 24 h. This finding suggests that the decline reported previously may have reflected mainly CYP2C8. IFN is released mainly from T cells in response to antigenic stimulation or LPS treatment. Rat CYP2C11 was unaffected by IFN (Tapner et al., 1996), but here we found significant down-regulation of CYP2C8 mRNA and CYP2C9 protein in hepatocytes. Donato et al. (1997) reported previously that IFN down-regulated activities of CYP1A2, 2A6, 2B6, and 3A4 in human hepatocytes, as well as mRNA and protein expression of CYP1A2 and 3A4. Interestingly, they concluded that these effects were nitric oxide (NO)-dependent, because they were inhibited by an NO synthase inhibitor (Donato et al., 1997). The effects of IFN in our cultures were not NO-dependent, because we measured NO production in all of our experiments and the only treatments that stimulated NO production were IL-1 and LPS (results not shown). The possible role of NO in regulation of human P450 mRNAs and proteins by LPS and IL-1 remains to be elucidated. In general, the response of CYP3A4 protein was in good agreement with the mRNA data. For CYP3A4, LPS and IL-6 down-regulated the mRNA by 90% 24 h post-treatment. 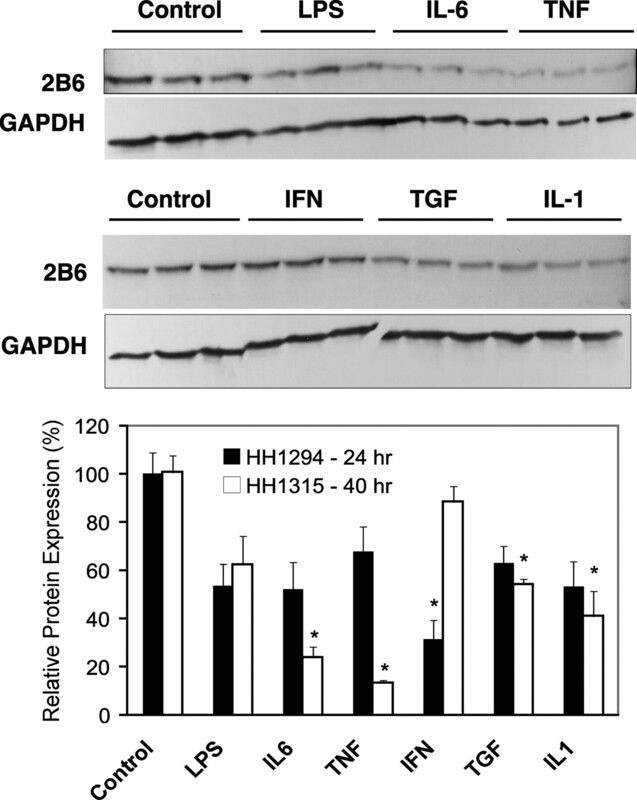 Because only IL-6 and TGF down-regulated CYP2C9 and CYP2C19 mRNAs, the down-regulation of CYP2C9 protein at 24 h by all treatments suggests that LPS, IL-6, TNF, IFN, and IL-1 may inhibit translation and/or stimulate degradation of CYP2C9 protein. It must be recognized that conclusions of this type, drawn from single time point analyses, are speculative. Alternatively, these agents could have produced a transient decline in CYP2C9 mRNA that had recovered by 24 h. In our hands, the low expression levels of CYP2B6 in uninduced hepatocytes made CYP2B6 protein analysis especially challenging. IL-6 and IFN clearly down-regulated both protein and RNA of CYP2B6, whereas TNF, TGF, and IL-1 had little effect on the mRNA but caused significant down-regulation of CYP2B6 protein. Again, one could speculate that, as seen with CYP2C9, post-transcriptional mechanisms may be involved. More detailed kinetic analyses are required to construct a better picture of any post-transcriptional regulation and the mechanisms involved. However, the limited availability, genetic variability, and culturing tolerances of human hepatocytes make this work challenging. Cytokines trigger very specifically controlled responses to infection and inflammation, and these studies are critical in furthering our understanding of human drug metabolism and the responses of individuals to drugs after inflammation or infection. Although primary cultures of human hepatocytes represent the best model for studying human P450 responses to inflammation and infection, it is important to recognize the potential for variability in this system. We addressed this by testing the effects of cytokines in a large number of individuals from a range of ethnic groups and ages. Remarkably, the effects of cytokines on P450 mRNA expression in hepatocytes from these individuals were quite consistent, reflected by the relatively low variability of the data. Our results clearly show that the CYP2C responses to cytokines differ from each other and from those of CYP2B6 and CYP3A4. These data suggest strongly that, even with the overlapping effects of cytokines, human P450s are independently regulated in response to inflammation and infection. This variability in response to cytokines may be critical for patient care, because it predicts that P450s are likely to be differentially regulated at different stages and by different mechanisms, in response to inflammatory attack or disease. This prediction is borne out by the differential sensitivity of P450-dependent clearance observed in infectious liver disease (Frye et al., 2006). This work was supported by Grants GM46897 and GM069971 from the National Institutes of Health (E.T.M.). Hepatocytes were provided by Dr. Steven Strom via the Liver Tissue Procurement and Distribution System, National Institutes of Health Contract N01-DK-9-2310. This work was presented in part at Experimental Biology 2006: Aitken AE and Morgan ET (2006) Regulation of human cytochrome P4502C mRNAs by cytokines. FASEB J20 (Suppl S):A425.4. ABBREVIATIONS: P450, cytochrome P450; IL-6, interleukin-6; CAR, constitutive androstane receptor; PXR, pregnane X receptor; IFN, interferon γ; IL-1, interleukin-1β; TNF, tumor necrosis factor-α; TGF, transforming growth factor β; LPS, lipopolysaccaride; GAPDH, glyceraldehydes 3-phosphate dehydrogenase; PBS, phosphate buffered saline; RT, reverse transcriptase; PCR, polymerase chain reaction; NO, nitric oxide. Abdel-Razzak Z, Corcos L, Fautrel A, Campion JP, and Guillouzo A (1994) Transforming growth factor-β1 down-regulates basal and polycyclic aromatic hydrocarbon-induced cytochromes P-450 1A1 and 1A2 in adult human hepatocytes in primary culture. Mol Pharmacol 46: 1100-1110. Abdel-Razzak Z, Corcos L, Fautrel A, and Guillouzo A (1995) Interleukin-1β antagonizes phenobarbital induction of several major cytochromes P450 in adult rat hepatocytes in primary culture. FEBS Lett 366: 159-164. Abdel-Razzak Z, Loyer P, Fautrel A, Gautier JC, Corcos L, Turlin B, Beaune P, and Guillouzo A (1993) Cytokines down-regulate expression of major cytochrome P-450 enzymes in adult human hepatocytes in primary culture. Mol Pharmacol 44: 707-715. Aitken AE, Richardson TA, and Morgan ET (2006) Regulation of drug-metabolizing enzymes and transporters in inflammation. Annu Rev Pharmacol Toxicol 46: 123-149. Ashino T, Oguro T, Shioda S, Horai R, Asano M, Sekikawa K, Iwakura Y, Numazawa S, and Yoshida T (2004) Involvement of interleukin-6 and tumor necrosis factor α in CYP3A11 and 2C29 down-regulation by bacillus Calmette-Guérin and lipopolysaccharide in mouse liver. Drug Metab Dispos 32: 707-714. Assenat E, Gerbal-Chaloin S, Larrey D, Saric J, Fabre JM, Maurel P, Vilarem MJ, and Pascussi JM (2004) Interleukin 1β inhibits CAR-induced expression of hepatic genes involved in drug and bilirubin clearance. Hepatology 40: 951-960. Beigneux AP, Moser AH, Shigenaga JK, Grunfeld C, and Feingold KR (2002) Reduction in cytochrome P-450 enzyme expression is associated with repression of CAR (constitutive androstane receptor) and PXR (pregnane X receptor) in mouse liver during the acute phase response. Biochem Biophys Res Commun 293: 145-149. Carcillo JA, Doughty L, Kofos D, Frye RF, Kaplan SS, Sasser H, and Burckart GJ (2003) Cytochrome P450 mediated-drug metabolism is reduced in children with sepsis-induced multiple organ failure. Intensive Care Med 29: 980-984. Cheng PY, Wang M, and Morgan ET (2003) Rapid transcriptional suppression of rat cytochrome P450 genes by endotoxin treatment and its inhibition by curcumin. J Pharmacol Exp Ther 307: 1205-1212. Donato MT, Gomez-Lechon MJ, Jover R, Nakamura T, and Castell JV (1998) Human hepatocyte growth factor down-regulates the expression of cytochrome P450 isozymes in human hepatocytes in primary culture. J Pharmacol Exp Ther 284: 760-767. Donato MT, Guillén MI, Jover R, Castell JV, and Gomez-Lechon MJ (1997) Nitric oxide-mediated inhibition of cytochrome P450 by interferon-γ in human hepatocytes. J Pharmacol Exp Ther 281: 484-490. Frye RF, Schneider VM, Frye CS, and Feldman AM (2002) Plasma levels of TNF-α and IL-6 are inversely related to cytochrome P450-dependent drug metabolism in patients with congestive heart failure. J Card Fail 8: 315-319. Frye RF, Zgheib NK, Matzke GR, Chaves-Gnecco D, Rabinovitz M, Shaikh OS, and Branch RA (2006) Liver disease selectively modulates cytochrome P450 -mediated metabolism. Clin Pharmacol Ther 80: 235-245. Gervot L, Rochat B, Gautier JC, Bohnenstengel F, Kroemer H, de Berardinis V, Martin H, Beaune P, and de Waziers I (1999) Human CYP2B6: expression, inducibility and catalytic activities. Pharmacogenetics 9: 295-306. Goldstein JA and de Morais SM (1994) Biochemistry and molecular biology of the human CYP2C subfamily. Pharmacogenetics 4: 285-299. Guillén MI, Donato MT, Jover R, Castell JV, Fabra R, Trullenque R, and Gomez-Lechon MJ (1998) Oncostatin M down-regulates basal and induced cytochromes P450 in human hepatocytes. J Pharmacol Exp Ther 285: 127-134. Iber H and Morgan ET (1998) Regulation of hepatic cytochrome P450 2C11 by transforming growth factor-β, hepatocyte growth factor, and interleukin-11. Drug Metab Dispos 26: 1042-1044. Jover R, Bort R, Gomez-Lechon MJ, and Castell JV (2002) Down-regulation of human CYP3A4 by the inflammatory signal interleukin-6: molecular mechanism and transcription factors involved. FASEB J 16: 1799-1801. Kraemer MJ, Furukawa CT, Koup JR, Shapiro GG, Pierson WE, and Bierman CW (1982) Altered theophylline clearance during an influenza B outbreak. Pediatrics 69: 476-480. Lang T, Klein K, Fischer J, Nussler AK, Neuhaus P, Hofmann U, Eichelbaum M, Schwab M, and Zanger UM (2001) Extensive genetic polymorphism in the human CYP2B6 gene with impact on expression and function in human liver. Pharmacogenetics 11: 399-415. Läpple F, von Richter O, Fromm MF, Richter T, Thon KP, Wisser H, Griese EU, Eichelbaum M, and Kivisto KT (2003) Differential expression and function of CYP2C isoforms in human intestine and liver. Pharmacogenetics 13: 565-575. Livak KJ and Schmittgen TD (2001) Analysis of relative gene expression data using real-time quantitative PCR and the 2(-ΔΔCT) method. Methods 25: 402-408. Martinez-Jiménez CP, Gomez-Lechon MJ, Castell JV, and Jover R (2005) Transcriptional regulation of the human hepatic CYP3A4: identification of a new distal enhancer region responsive to CCAAT/enhancer-binding protein beta isoforms (liver activating protein and liver inhibitory protein). Mol Pharmacol 67: 2088-2101. Morgan ET (1997) Regulation of cytochromes P450 during inflammation and infection. Drug Metab Rev 29: 1129-1188. Muntane-Relat J, Ourlin JC, Domergue J, and Maurel P (1995) Differential effects of cytokines on the inducible expression of CYP1A1, CYP1A2, and CYP3A4 in human hepatocytes in primary culture. Hepatology 22: 1143-1153. Nishimura M, Yoshitsugu H, Naito S, and Hiraoka I (2002) Evaluation of gene induction of drug-metabolizing enzymes and transporters in primary culture of human hepatocytes using high-sensitivity real-time reverse transcription PCR. Yakugaku Zasshi 122: 339-361. Renton KW (2004) Cytochrome P450 regulation and drug biotransformation during inflammation and infection. Curr Drug Metab 5: 235-243. Richardson TA and Morgan ET (2005) Hepatic cytochrome P450 gene regulation during endotoxin-induced inflammation in nuclear receptor knockout mice. J Pharmacol Exp Ther 314: 703-709. Rivory LP, Slaviero KA, and Clarke SJ (2002) Hepatic cytochrome P450 3A drug metabolism is reduced in cancer patients who have an acute-phase response. Br J Cancer 87: 277-280. Rodríguez-Antona C, Bort R, Jover R, Tindberg N, Ingelman-Sundberg M, Gomez-Lechon MJ, and Castell JV (2003) Transcriptional regulation of human CYP3A4 basal expression by CCAAT enhancer-binding protein alpha and hepatocyte nuclear factor-3 γ. Mol Pharmacol 63: 1180-1189. Rodríguez-Antona C, Jover R, Gomez-Lechon MJ, and Castell JV (2000) Quantitative RT-PCR measurement of human cytochrome P-450s: application to drug induction studies. Arch Biochem Biophys 376: 109-116. Schuetz EG (2004) Lessons from the CYP3A4 promoter. Mol Pharmacol 65: 279-281. Shimada T, Yamazaki H, Mimura M, Inui Y, and Guengerich FP (1994) Interindividual variations in human liver cytochrome P-450 enzymes involved in the oxidation of drugs, carcinogens and toxic chemicals: studies with liver microsomes of 30 Japanese and 30 Caucasians. J Pharmacol Exp Ther 270: 414-423. Siewert E, Bort R, Kluge R, Heinrich PC, Castell J, and Jover R (2000) Hepatic cytochrome P450 down-regulation during aseptic inflammation in the mouse is interleukin 6 dependent. Hepatology 32: 49-55. Strom SC, Pisarov LA, Dorko K, Thompson MT, Schuetz JD, and Schuetz EG (1996) Use of human hepatocytes to study P450 gene induction. Methods Enzymol 272: 388-401. Sunman JA, Hawke RL, LeCluyse EL, and Kashuba AD (2004) Kupffer cell-mediated IL-2 suppression of CYP3A activity in human hepatocytes. Drug Metab Dispos 32: 359-363. Tapner M, Liddle C, Goodwin B, George J, and Farrell GC (1996) Interferon γ down-regulates cytochrome P450 3A genes in primary cultures of well-differentiated rat hepatocytes. Hepatology 24: 367-373. Tian Y, Ke S, Denison MS, Rabson AB, and Gallo MA (1999) Ah receptor and NF-κB interactions, a potential mechanism for dioxin toxicity. J Biol Chem 274: 510-515. Totah RA and Rettie AE (2005) Cytochrome P450 2C8: substrates, inhibitors, pharmacogenetics, and clinical relevance. Clin Pharmacol Ther 77: 341-352. Zhou C, Tabb MM, Nelson EL, Grun F, Verma S, Sadatrafiei A, Lin M, Mallick S, Forman BM, Thummel KE, et al. (2006) Mutual repression between steroid and xenobiotic receptor and NF-κB signaling pathways links xenobiotic metabolism and inflammation. J Clin Invest 116: 2280-2289.